I was searching Google images the other day for a good picture of the flowers of Sweet Violet (Viola odorata) and could not find one, so I took a few pictures using a hand lens today. Although we have a number of native violets, this species was introduced from Europe and is commonly found in lawns. It has leaves and flowers arising directly from slender stolons (runners) rather than leafy upright stems. 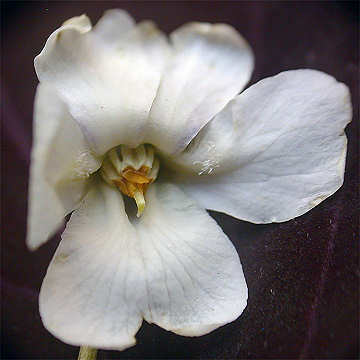 The flowers can be white to purple. 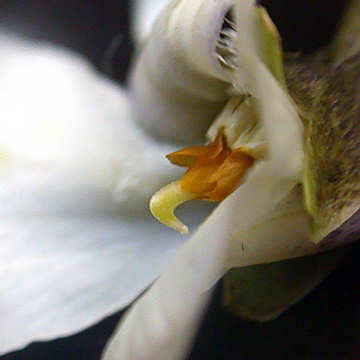 A feature that distinguishes it from similar violets is a downward curved hook at the end of the style. Thanks! I have looked around the internet for a good photo of the hooked stigma but this in the only one that I have come across that clearly shows the hook.